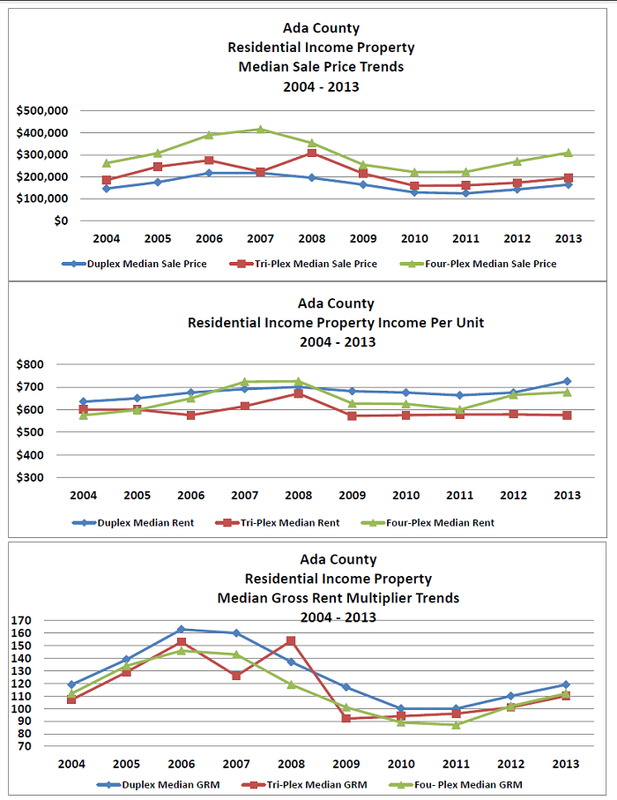 Below are some great graphs providing insight into the residential investment market for duplexes, triplexes, and fourplexes within Ada County, produced by Alan Smith, GIS/Appraisal Analyst, on March 10, 2014. All of the sales and listing data came from the Intermountain Multiple Listing Service and the Ada County Assessor's Office between 2004-2013. The reports do show the trends well. However, it is unknown if the rents used in some of the calculations were actual rents or market rents. What a seller and/or the seller's listing agent believe to be "market rents" isn't always accurate. So what I am saying is that while the reports do accurately identify trends, the actual GRMs posted could be skewed. Mr. Smith states that residential income property values increased by slightly over 1% per month throughout 2013. When I do my proformas, I typically use 3% per year. That certainly proves to be very conservative for at least the past few years. For additional illustration, I thought I would use some of the data that I collect to show you how some of these numbers can be used to develop approximate value. For my illustration I used $2,500 as my Gross Monthly Rents. I also used $18,000 as my Net Operating Income (NOI). NOI is your gross annual rents, less vacancy, less property expenses, such as utilities, property taxes, hazard insurance, and repairs. NOI does not include debt service or capital expenditures. I also used a Gross Rent Multiplier (GRM) of 119, which is the average I have calculated for the first quarter of 2014. I used a Cap rate of 6% which is pretty indicative to the current market.